Extra Frugal - How Frugal Can You Go? Original version of this post from one of my other sites, Simple. Organized. Life., but has been adapted for My Two Dollars. I am not nearly as frugal as I probably should be, but I do try my best. I don’t really waste money or food, I don’t ever shop for clothes, and I try to track where our money goes. However, my wife and I love a good meal out and probably spend too much money every month enjoying those meals (Last month was $250. Ouch!) But at home, I do try to be as frugal as possible, and I just found one more way to save a little bit of money…by cutting our tube of toothpaste open when I thought it was empty. I was just about to throw it away to open a new one, and wondered if there could possibly be more still left inside that couldn’t be squeezed out. So I got out the scissors and cut the tube in half. There was still a ton left inside! Have you ever done something like this? I know I have some frugal readers, as I hear from them all the time with tips and tricks to save more money. I guess the reason I cross-posted this from my other site is to learn just how frugal you guys can get! How far do you take your frugality? Is there something you can share with us that will set off lightbulbs in our head about what else we could be doing? I want to know! I have posted before about different ways we have been frugal, from hauling my own trash to save $27 a month to choosing to not care what others think of us anymore. But I want to know what else I could be doing, as this toothpaste project really got me thinking! I am not a frugal as I could be either, but I have quite often made thinks that I could have bought. Oh, and I repair my bike myself…but that is fun! We’ve been really regulating out heating and cooling for almost a year now with great success. During last summer, we kept the temp inside at around 75 instead of 70, and cut our electric bill in half most months. During the winter we’ve been keeping the heat at 64 instead of 70. I haven’t received the oil bill yet, but I’d be willing to bet it’ll be much less than last year. I must say that I DO get pretty chilly sometimes in the house. But it’s worth it. I had the same realization with a tube of lotion a few years ago–it still contained about three days’ worth of product. 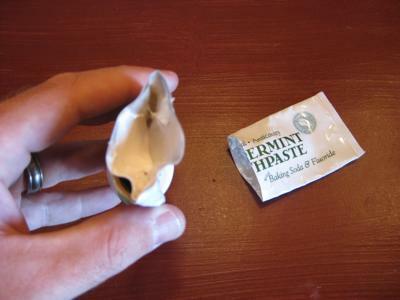 As far as toothpaste goes, I’m merciless about squeezing the tubes to death so I don’t have to cut them open–it also helps that the material is more malleable. The plastic used to make tubes of lotion, however, seems more resilient, so those I cut open. I am with you on that, we really watched our temps this winter too! I bought one of these toothpaste squeezers at the dollar store. Gets all the paste out without having to cut it open. Yeah, we squeeze the toothpaste until our fingers are finally glad we give it up!! I use a squeezer for my toothpaste, but I’m a fanatic when it comes to tubes of lotion for hands or face. I cut open the tube where the seamed end is and wrap a piece of saran wrap with a rubber band over the end to keep it from drying out. When my finger isn’t long enough anymore, I cut off some more till I get to the end. I have gotten as much as a 2 or 3 weeks worth of lotion and that is using it every day. Because of my hair dressing experiance, I know that you don’t need an elaborate amount of lather to het clean hair. I have alway’s used a travel shampoo bottle filled half full of shampoo the rest water. Shake till it’s blended.I have made a 12 oz. A 12 oz. Bottle of shampoo has lasted me up to a year or more. Having color treated hair, I need to. Use good shampoos but being frugal want to make sure I get my dollars worth out of an expensive solon shampoo! We buy large bottles of laundry detergent, and when it gets to the end, my husband props it up so a corner is facing down, then pops a hole in that corner and lets it drain into a cup….we get at least 3 loads worth of soap that would be thrown away! I hate to pay $!.19 for a travel size tube of toothpaste, so I just keep a plastic travel-size tube and refill it from my main tube by forcing the two openings precisely together, then squeezing the main tube’s contents into the travel size. Be sure to do this just before beginning your normal toothbrushing so that any that escapes can be used for its regular purpose. 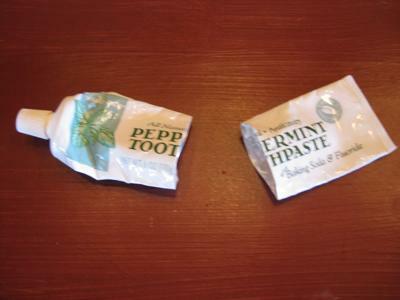 My dentist says you only need a dab of toothpaste the size of a green pea, so that helps make a tube last longer. The full brush-length amount shown in ads is just for encouraging consumption and artistic appearance. Also, for a free monthly fluoride treatment, just spit but don’t rinse out the toothpaste from your morning brushing once a month, just before you leave for work. It will have time to penetrate and you can rinse your mouth once you get where you’re going. If you have a couple of stainless steel water bottles, one can be ready to travel with you at any time. Save $1.49 every time you leave the house! If you take a Fiber One bar and an apple when you leave the house for a period that would include lunch, you can eat well and cheaply. Or put the morning’s left-over coffee into a small stainless thermos to carry along. A stainless thermos will pay for itself very quickly. Yes, it is heavier, but you need the exercise! And it makes a pleasant interlude in the day to have a drink you like during a relaxed moment. For some surprising savings on a daily expense, try reading the markings on your washing machine detergent and the accompanying dipper. You’ll find a full dipper is probably for an extra-large load of really nasty clothes. You should probably be using about 1/3 of a typical dipper. Rest your shoes. Do not wear the same pair on consecutive days. They will hold up better and smell better, too. Get good shoes and take care of them. Find a clerk who cares to fit you properly and return to him/her regularly. My guy knows what characteristics a shoe should have to work for me. I nearly choked when he told me to get a pair of $89 sandals, but I have worn them for three summers and they are well worth it in comfort and arch support. Make soup! it uses leftovers well, is warming and delicious, and gives you only one pot to wash. Casserole, burger and pizza leftovers can be thinly sliced and included. They’ll blend in surprisingly well. Cabbage/carrot slaw is often cheaper to serve than salad, and serves much the same purpose in a meal. Add finely shredded onion or a chiffonade of flat Italian parsley from your side garden to jazz it up and improve nutrition.